The side curtain airbags help protect the heads of the driver and passengers in the outer seating positions during a moderate-to-severe side impact. The side curtain airbags equipped in this vehicle are also designed to help reduce the likelihood of partial and complete ejection of vehicle occupants through side windows in crashes, particularly rollover crashes. The side curtain airbags are located in the ceiling above the side windows on both sides of the vehicle. 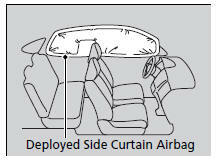 The side curtain airbag is designed to deploy in a rollover or a moderate-to-severe side impact. If the SRS control unit senses that your vehicle is about to rollover, it immediately deploys both side curtain airbags and activates both front seat belt tensioners. If the impact is on the passenger’s side, the passenger’s side curtain airbag deploys even if there is no passenger in the passenger seat. To get the best protection from the side curtain airbags, occupants should wear their seat belts properly and sit upright and well back in their seats. Do not attach any objects to the side windows or roof pillars as they can interfere with the proper operation of the side curtain airbags. 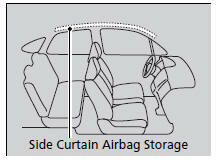 One or both side curtain airbags may also inflate in a moderate-to-severe angled frontal collision.